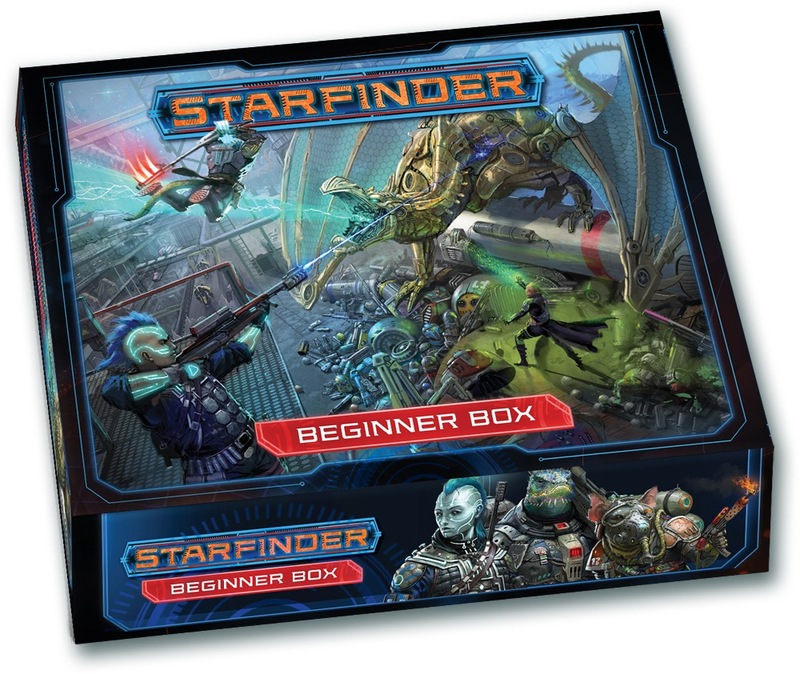 Note: The Starfinder Beginner Box is not included in the Starfinder Roleplaying Game Subscription. 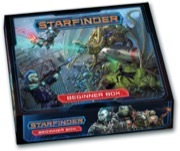 Starfinder Roleplaying Game Subscribers who preorder the Starfinder Beginner Box will receive a free PDF version when the Starfinder Beginner Box ships. Will this be part of any Starfinder subscriptions? I’m not seeing a release date for this here. When is this expected to release? The Starfinder Beginner Box will not be included in any Starfinder subscriptions. It will be released in April. The page now reflects that. Are there PDFs to go along with this? And what is the size of the box? The preview makes it look like it's the size of a Pathfinder Adventure Card Game basic set box, but that might just be a mockup. I’m looking forward to this, although I really wish these came out earlier. I’m hoping the PF2 Beginner Box will be closer to PF2’s release date. Will there be a digital version and if so, will it be included with physical preorders? Can the holiday discount be used when preordering this? It doesn’t usually apply to preorders. The Pathfinder Beginner Box had four pregens, this has six (out of seven possible different classes). At first, i thought the mechanic wasn't to be included, because of it's drone feature. Now i think the Solarian is the one class not included, as it is too complicated. Can anyone shed some (star)light on which iconic hero isn't included? I'm intrigued by the "advice on how to create your own science fantasy tales" bit. I feel like a lot of people go into Starfinder expecting D&D in space (a la Spelljammer), or else something much more akin to true science fiction, and are surprised to see the amount of influence magic and gods and the supernatural have over the game. Science fantasy isn't the best defined genre out there, so a lot of people don't really know what to do with it. Starfinder's greatest strength - it's truly sandbox setting that allows scientific ambition, humanistic ideals, zealous religions and divine power, and Lovecraftian nihilism to exist concurrently and all be equally valid - is also its greatest weakness. There's too much extra thinking ahead involved. Pathfinder can get away with being a sandbox setting because it can be concisely understood: "sword and sorcery, Lord of the Rings flavor fantasy except God is dead and the reliability of prophecy and fate with him." It's easy to pick up the game and play Pathfinder or even make your own setting from there. With Starfinder, a host of questions require the game master to put in a lot of extra thought ahead of time. What to do with a world where Heaven, the Devil, Cthulhu and space Elon Musk all exist concurrently? How are gods supposed to work in a world where a local drought or plague can be cured with commercial imports and advanced medicine? What effects does magic and the gods have on technological and social progress? How prevalent is magic, and is it more powerful than science? While fantasy has an abundance of pre-made templates giving GMs an idea of what a fantasy world is supposed to look like, science fantasy is a much more amorphous genre. As much as I love Starfinder's setting, I also know a lot of people who prefer to make their own, and often feel at a loss as to how to make a science fantasy world feel cohesive and make best use of the genre's flavor. I think it would be really helpful to have a creative world-building section, a campaign builder, and some talk about how various genres can make best use of science fantasy's unique setting. I really liked the "Corrupted by Shadows" and "Horrow Campaigns" articles in SoS AP1. Did a great job running over the fundamentals of horror with good advice about how science fantasy can interact with it. That, or a Starfinder Game Master's Guide. I adore Pathfinder's, and I would buy this book in a heartbeat. Any of those options sounds amazing. I really hope a Starfinder Game Master's Guide is released, as I'm finding that science fantasy is vastly different beast compared to typical RPG fantasy. I would also like to know that. Will there be a PDF version? If so, will it be included with a preorder? Super excited for the Starfinder Beginner Box! I see that now a PDF version has been added. Since nothing is stated on the page, I must assume that it will have to be purchased separately and won't be included with pre-orders. It's possible that this will work like some of the Pathfinder stuff has, where if you are a subscriber to one of the Starfinder lines (probably the hardcover rulebooks) and preorder this, you will get the PDF for free. We'll need to wait for official word to know for sure. That's what I originally thought (and hoped for), but this is usually stated on the page for the product. Hopefully someone from Paizo will eventually chime in. Will there be a way for Starfinder RPG subscribers to get the PDFs for this product, as there was with the Pathfinder Beginner Box? I agree and disagree at the same time, much like you say being science fantasy is a strength and weakness. While it is a vague genre, it's because it's just all forms of play mushed together. You can liken it to steampunk being "fantasy science fiction" seeing we've got technology creeping into a fantasy world. It's a matter of degrees. I couldn't see any guns appearing in LOTR, but in Pathfinderverse gunslingers are definitely present. I like that you mention people make their own versions of the world, picking and taking the Pact Worlds lore for what they need and ignoring the parts that don't apply/sweeping them under the rug. I use this when making my own sessions, but I let the players know what is/isn't available, and that other things will be determined on the fly. I do think a section that highlights this "slice of game world" idea to newer GMs would be real handy, but more than a "you're the GM, you decide!" paragraph or so. Plus I love the idea of a product that makes introductions for newer players so easy and engaging. Will rules for starship combat be included in the box? A good question, but judging from the description i would lean towards a no. It would be too complex to include and starship combat is only a minor (yet exciting) part of the game, which doesn't offer as much for the Mystic, Solarian & Technomancer as for the other classes. There aren't even all seven base classes included. They might include some abridged rules for starship combat plus a couple of ships but not the rules for actually building ships. That'd save some page count. Does the pre order come with the PDF if you have all of the Starfinder subscriptions? I wonder what dice are included and if they are exclusive to the set. What map will be included? It's the standard mix of seven non-exclusive dice. One side is a map for the adventure in the Game Master's Guide, the other is a "basic" side for drawing your own maps. I've been a sucker for cool RPG box sets since the classic "red box" back in the 80's, so I'm excited for this! I do have a question: I am planning to run the adventure from the box at a local game store for a games day shortly after release. I'd like to offer a Starfinder Society chronicle sheet to those who are interested. Will there be a chronicle sheet available at launch? Very excited for the Beginner Box. Although, I disagree with the idea that starship combat would be a "minor" part of the game. It is one of the most distinguishing features of this rpg, it's what makes it different from being "just Pathfinder in space" and I really wish they included this! Furthermore, Mystics can make perfectly good captains (Bluff, Diplomacy), as well as Solarians (Intimidate, Diplomacy) and Technomancers are just as good at Piloting and Gunnery as anyone else, plus they are naturally perfect science officers. So saying that starship combat is inconsistent in what it offers to players is absolutely wrong. That would be perfectly appropriate, I really hope they included at least this. Can we have a reply from a dev please? I'd like to see a definitive ruling on whether or not the PDF (or PDFs? multiple books, map, pawns?) is included with the product for product line subscribers (I do realize this product is not part of a subscription). If it is, I would definitely preorder here. If not I can preorder from a reseller, with a discount, then buy the PDF here and come in at the MSRP. Pathfinder Adventure Path # 139 includes an ad for this box where you can see the content. The Solarian is indeed the class that is excluded. The dice are colored black. One sheet of pawns is also depicted - most shown pawns are medium creatures, one is a large creature. Sadly the flip-mat isn't shown. Also no news about starships. Maybe we can get some sample art? You're in luck! They did an unboxing video on Twitch, and showed off a lot of the art. The adventure material was mostly kept back, for obvious spoiler-related reasons. The video is up on YouTube now here. I'm a big fan of the reference cards myself. They did not talk about the pdf however, to my memory. I have to say i don't watch any of Paizos twitch videos - this one is 30 minutes long - as i don't have the time. If i want to watch a video, i watch a series (TWD, ST: Discovery, Supernatural etc.). You really alienate me (and a lot of players i know) with the fact that these informations are only available as videos (which by itself is fine), but not as written text and sample images too. I know twitch is the latest hot $#i!, but please make the informations revealed there also available in conventional blogs or on the product pages. Is this part of a subscription, I thought it was but it's not showing up on my subscription page. I can’t find official confirmation, but I don’t think so. They copped a bit of flak for including the PF Beginner Box in the subscription, so my guess is they took that feedback onboard and made it opt-in. EDIT: Found it! confirmed that it’s not part of any subscription. It would probably be useful to hear if Starfinder subscribers (of some flavour) will receive free PDFs if they preorder. That’s been standard before in “this type of situation” but has always been made explicit. If it’s not true here, there may be people operating on the assumption it is. It has been asked several times already in this thread, but there has been no answer that I'm aware of. Only subscriptions come with free pdfs; since the Starfinder Beginner Box is not part of a subscription, it does not come with a free pdf. The pdf must be purchased separately. In the past, this wasn't true. Many products, which were not part of a subscription, were offered with a free PDF to those who pre-ordered and were subscribed to a "matching" line. Those were the exceptions, not the standard. The only two that come to mind are the collected editions of RotRL and CotCT. A more detailed discussion about PDFs for this product is taking place in this thread. Is Vic Wertz's statement definitely not true then?